When is comes to Blaine, the Cinnabar Island Gym Leader, his team doesn't differ much for your first encounter. 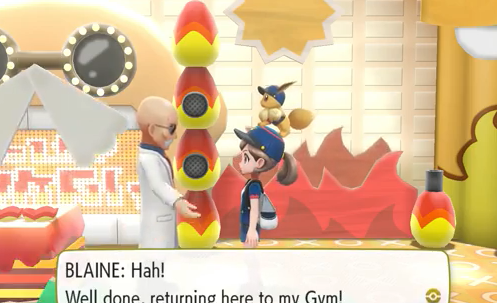 In your first battle with him, Blaine will use four different Fire Type Pokemon that are all at higher than Level 45. When faced in a rematch, Blaine will have five Pokemon, four of which will be the same Pokemon Species as in your first battle with him (except at higher Levels). To be exact, all of his Pokemon this time around will be at Level 56, with the exception of his Arcanine that will be at Level 57. In all, Blaine will battle with Magmar, Rapidash, Ninetales, Flareon and Arcanine this time around. Just like your first match against him, Blaine's Pokemon Team will still be extremely weak against Water Type Pokemon. Not only do Blaine's Pokemon hate being hit with Water Type Attacks, but their Fire Type Attacks also won't cause much damage to Water Type Pokemon. By having a number of Water Types in your party when facing Blaine in a rematch, preferably ones at Level 55 or higher in order to match up well, it shouldn't be all that difficult to defeat him.